Medium-Duty Cutting and Welding Outfit. Receive a $50 rebate when you purchase this Torch Outfit. Buy Additional Miller accessories for an even larger rebate! Click the banner to download Miller's Latest Rebate Flyer for additional details! 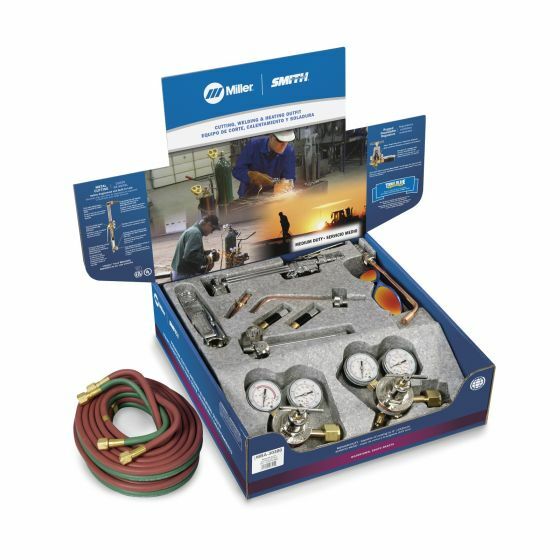 The Miller Medium-Duty Combination Torch Complete Acetylene Outfit (MBA-30300) builds off Smith's rich history of quality cutting outfits. Miller's Medium-Duty outfits feature proven in-tip gas mixing technology and include torch-mount flashback arrestors. These outfits feature a rugged cutting attachment and torch handle that are covered by the Miller True Blue lifetime warranty. Series 30 single-stage regulators are extremely durable and contain Miller's exclusive Sure Seat filtered seat technology. Filtered seats prevent contamination from entering the seating area, reducing repair costs and downtime. Flashback arrestor are designed to prevent the advancement of a flashback fire as well as the built in check-valve prevents the reverse flow of mixed gases. Slip-in cutting tips Save time when changing tips — no wrench needed. Resilient Graf-Tite seat material protects tip from nicking and maintains positive seating. Requires less replacement than metal-to-metal seat designs. Graf-Tite soft seats Resilient Graf-Tite seat material protects tip seating areas from nicking to maintain positive seating. Requires less replacement than metal-to-metal seat designs. Compressible soft seats are practically indestructible and withstand extremely high temperatures, resulting in longer tip life. Corrosion resistant balls and brass seating surface provides gall resistance and positive chatter free seating. 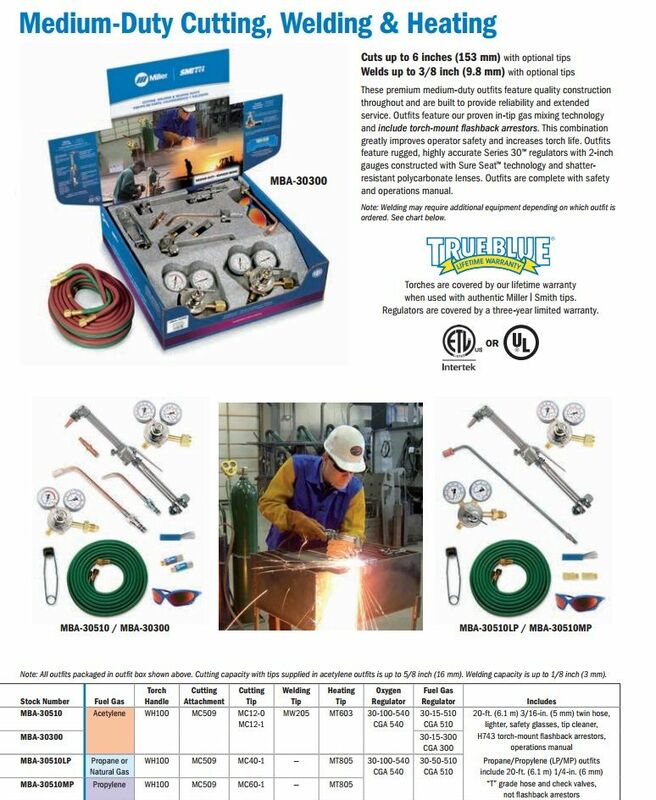 Cutting attachment and torch handle are covered by the Miller True Blue lifetime warranty when used with authentic Miller-Smith tips. Internal threads Threads are protected from damage if the torch is dropped, eliminating costly torch repair, replacement or downtime. Double-tube handle Tube-within-a-tube design provides strength while reducing weight. Internal tube is silver brazed for extra protection, strength and leak resistance. 5 stars - "Great-Product" James S. Love-the-ease-of-work.